So, who watched the debate? I watched it while I cleaned the kitchen. Doing something physical was helpful to keep my mind occupied enough with something else so as to not scream at the tv. Seriously though, apart from the time that John McCain talked in a melodramatic way about the bracelet he had from the mother of a soldier who died in Iraq and then Obama said, “I have a bracelet, too,” I was able to keep from too many snide remarks. I admit to some concern about how McCain would do, but I honestly think he held his own pretty well. The dem spin is that he talked too much about what he did 30 years ago, but I really felt those points did bring attention to Obama’s lack of experience. McCain may have dropped too many names and said he loved Petraus too much, but overall, I was pleasantly surprised with his performance. For a little debate humor, take a look at this. I’ve been thinking about the 1992 election a lot lately. In November 1992, I was 27 years old, married for just a little under a year, and really afraid of Bill Clinton becoming president. Then, it happened. The election was over and Bill Clinton was president. I don’t know what I thought was going to happen, but I was truly frightened. However, if we take a little trip down memory lane to the months before the election, we see that incumbent President George HW Bush was thought to be invincible. He had high approval ratings in the polls because of the success of Dessert Storm. Then in a few short months, with perseverance and an excellent campaign staff and who knows what else, Bill Clinton rallied to victory. I am remembering this little bit of history because as the 2008 election draws near, I think there is genuine fear among conservatives that Obama may be the next president. I can actually say I am more fearful of what life with Obama as president would be like than I was about Clinton. But, if we look back at that 1992 campaign, we see that it isn’t over until all the votes are in and things can change direction very quickly. As republicans push toward the election, they can take solace remembering that no matter what the polls and the media are saying in July through October, what matters are the results in November. Well, I didn’t get the full-time job, so that is off the table. And, that’s a good thing. The more I think about it, the more I realize I need to make decent money while having more control of my schedule. Which brings me to the part-time job. It’s not a bad little gig–3 days a week during school hours. However, there are some issues. First, the person I am replacing was fired for embezzling. I think that makes the scrutiny over me a little more intense than I prefer. Second, there’s no one there to tell me exactly how they want things done. It is sort of guess work on the part of one of the managers. Third, the manager who has the most contact with me and tells me how he thinks they want things made the most appalling statement I have ever heard in workplace chit chat. Sarah Palin has added life to this election–whether you like her or hate her, you have to admit having her on the ticket makes things more interesting. Imagine what the republican convention would have been like if Joe Lieberman had been the VP candidate. 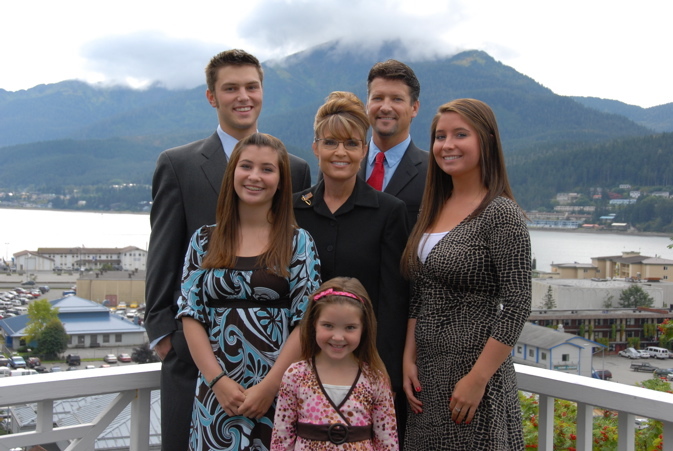 I like a lot about Sarah Palin. And, I think that is how it is with every candidate. You can’t be 100% satisfied with who you vote for. Do I have opinions and even strong beliefs about how hard it would be to raise any number of children–especially 5–and be in any kind of public office? Yes. I can’t imagine how a mother works in any sort of responsible job and handles all the details of motherhood, let alone handling public life. But it is done, and people manage it. I was really excited when Palin was named last week. I still like her as a candidate. I am praying for her daughter and unborn grandchild and her family as they deal with this situation, especially while the eyes of the world are watching.